Out of all the cookies I claim to be my favorite, biscotti are my one true love. They're crunchy and not too sweet, perfect for post-breakfast or a light dessert. 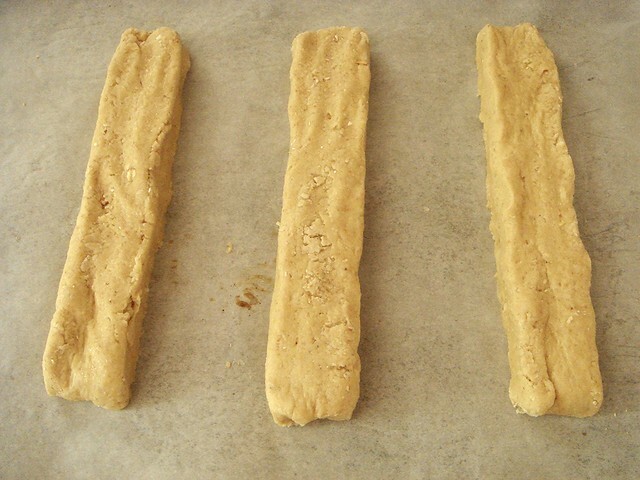 I got into a biscotti-making kick a few years ago and managed to create three recipes, though I only blogged about two of them. My inspiration for these biscotti probably occurred during my brown butter craze faze. I'm surprised I didn't add any orange zest because I was in the habit of flavoring everything orange, too. Instead, I stuck to freshly grated nutmeg and toasted, ground oatmeal. Toasted oatmeal is a great ingredient to add to baked goods. It has a very nutty, light taste. Because of the oatmeal, it's a little easier to pretend that a few biscotti are a good idea for breakfast. This must have been one of those recipes I made to test out, then forgot all about. Though I did make it again for gifts, and I gave the recipe to a friend who made it and said it was good. It's that whole picture taking step I sometimes have a problem doing. And so I made them to document on Tuesday, because it's going to get so hot this weekend (97° on Sunday - global warming came early this year!) that I knew I wouldn't want to bake now. 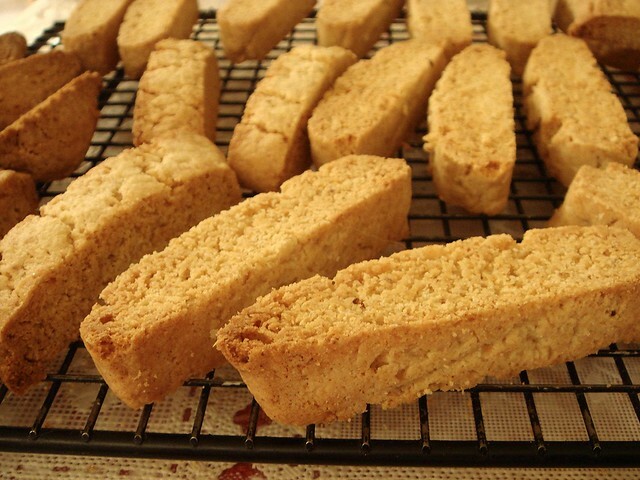 Biscotti require a few extra steps compared to traditional cookies. Once the logs are baked, they're sliced on the bias and baked again to brown. Because my version contains fat (butter and eggs), they don't get as hard as some biscotti do; what I mean is that you can eat them without dunking in coffee. I'm warning you now - biscotti are high-yield cookies. Biscotti morning, noon, and night! Italian cookies are that way and that's why I like them. I can feel another biscotti kick coming on. Perhaps I'll try a tropical biscotti. If you give this recipe a try, let me know how it goes! Preheat oven to 350°. Line a baking sheet with parchment paper. In a medium bowl, whisk together flour, oat powder, nutmeg, baking powder and salt. In a large bowl, beat together browned butter and sugar on medium for 2 minutes. mix in almond extract, then beat in eggs one at a time until well blended. Stir in flour mixture, mixing and pressing gently with the back of a rubber spatula until combined. The dough will not be sticky at all, and there may be large pieces of dough that are not combined with the lump, but as you form the logs you can easily press them together. Be careful not to overmix at this stage; as long as there isn't any powdery mixture remaining, you're all set. 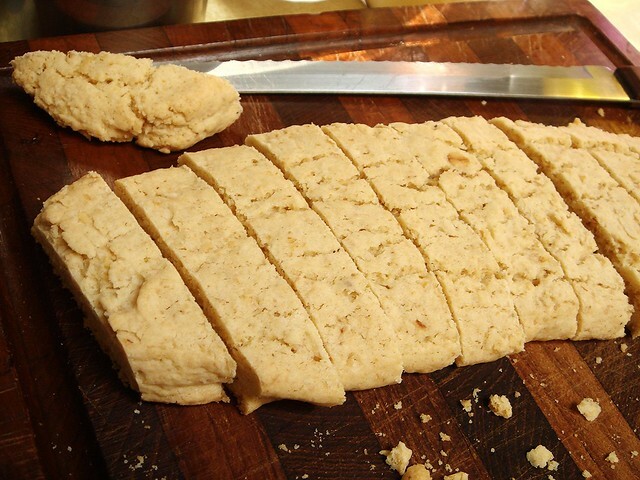 Divide dough into thirds, and place on the prepared baking sheet, evenly apart. pat each mound out to a log about 1 1/2-inches wide by 9-inches long. Bake for 20 minutes or until tops are ightly golden and firm when pressed. Transfer parchment sheet, with logs, onto a cooling rack and cool for 15 minutes. Place one log on a cutting board and slice on the diagonal into 1/2 inch slices. place slices on baking sheet (no parchment needed), and repeat with remaining logs. 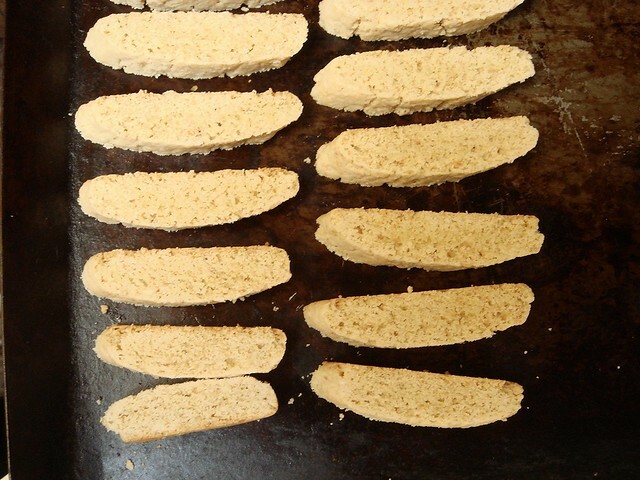 Bake for 10 minutes; remove sheet and flip biscotti over. Continue baking for another 10 minutes. 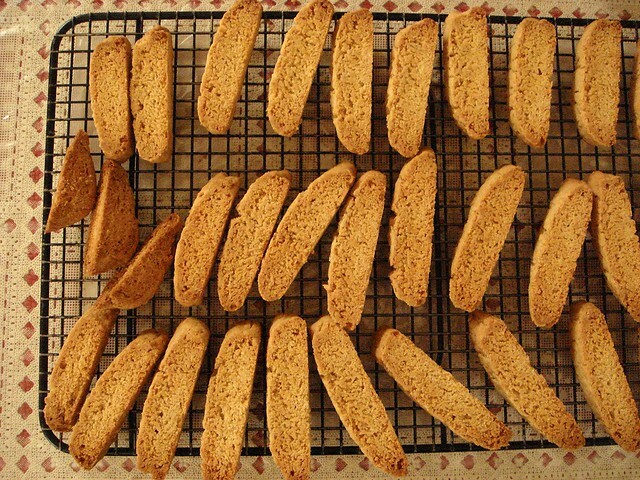 The biscotti should be dry to the touch and golden. Place biscotti on a wire rack to cool completely. I like the idea of toasting the oats and browned butter is always a good thing! Oh, I agree. Browned butter has left a lasting impression on me. Thanks for stopping by, CJ! I'm off to read your blog now. Mmm I love biscotti. And everything is better with butter right? Biscotti are one of my favorite cookies to snack on! I love how they're not TOO sweet. The brown butter must be fabulous in these! That is exactly why I enjoy the biscotti so much. Gonna have to make some soon. Tried this recipe today and the biscotti turned out real good. Used clarified butter instead of browned butter and increased the ground oatmeal to 1 cup and reduced the all purpose flour to 1 1/2 cup. The texture and taste is perfect. Will be making these over and over again. I'm glad to hear you liked them, Sunisha! Thank you for sharing your mods, too. Your biscotti were probably even nuttier and tasty!